Flowers adorn our gardens and homes with beauty and color. Did you know that you can eat flowers, too? While we often see flowers gracing a wedding cake, most of us don’t eat them. 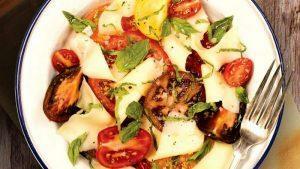 However, flowers can be used as a garnish, in salads, and even in cooked dishes, such as stir-fries. Eating flowers is nothing new. In fact, the use of flowers in cooking dates back as far as 3000 B.C. In ancient Rome, violets and roses were used in cooking, and lavender was used in sauces. Pumpkin and squash blossoms have long been used by many Native American tribes in a number of ways and eaten fresh, fried, in soups, or dried. Flowers are more than just a pretty face: they provide a surprising number of nutrition benefits, too. Vitamin C. Also known as ascorbic acid, vitamin C is an essential nutrient, acting as an antioxidant. It’s also needed to make collagen, helps the body to absorb iron, and keeps the immune system working properly. Nasturtiums, roses, wild borage, and chive blossoms are sources of vitamin C.
Vitamin A. Vitamin A is a fat-soluble vitamin needed for healthy vision, the immune system, proper organ function, and reproduction. Flowers high in this vitamin include pumpkin flowers, roses, and lavender. Potassium. Potassium is an electrolyte that helps to regulate blood pressure and heart function. Many flowers are an excellent source of potassium such as chrysanthemum, dianthus, nasturtium, and begonias. Phytonutrients. Phytonutrients are substances found in plants that provide health benefits. There are different types of phytonutrients, such as carotenoids and flavonoids; some are believed to help lower the risk of heart disease, for example, while others may lower risk of cancer, Type 2 diabetes, and other inflammatory conditions. Phytonutrient-rich flowers include marigolds, nasturtiums, woodland violets, roses, and chrysanthemums. Beautiful though they may be, some flowers are downright dangerous and can even be deadly, especially for children. These include rhododendron, wisteria, oleander, foxglove, daffodils, and hydrangea. Make sure you know which flowers are safe to eat. You can contact your local Cooperative Extension division to double-check. Or, to be on the safe side, purchase your flowers from vendors that specialize in edible flowers. And obviously avoid any flowers that you may be allergic to or that trigger conditions such as hay fever or asthma. Flowers are very perishable and won’t keep for long. Make sure they’re free of dirt and insects by shaking them gently and rinsing them in a bowl of cold water. Store them in the refrigerator and eat them as soon as you can. If you do need to keep them for a bit, place them between two moist paper towels and wrap them in plastic or an airtight container and keep them in the fridge. They should keep for up to a week. An online search for using and cooking with edible flowers will give you plenty of options and ideas. 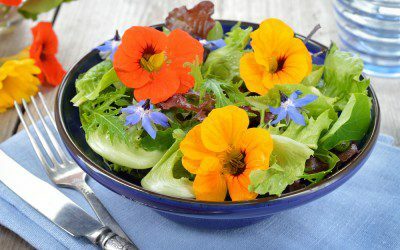 Edible flowers are naturally low in calories and carbs and can add color, flavor, and variety to many of your foods and beverages. Amy Mercer hopes for something that can make diabetes a truly invisible illness — a cure. Bookmark DiabetesSelfManagement.com and tune in tomorrow to read more.